The "Auto Picture Creator" docking window contains all choices you know for a building scheme as well as the settings for picture design and viewing direction you know from the "Picture Creation Assistant". When enabled, the structure picture automatically reflects all changes you make in the "Auto Picture Creator" window - that means some kind of "auto-apply" for a building scheme. 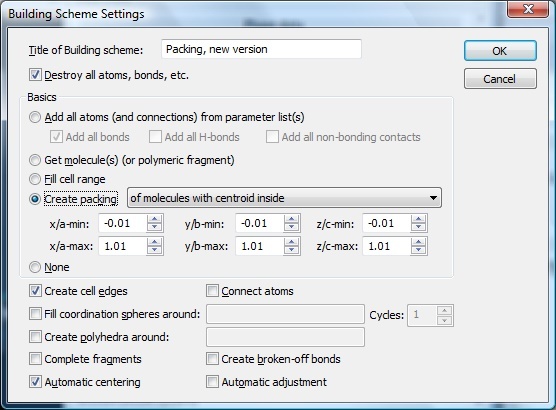 For instance, the cell range (or packing diagram) automatically increases/decreases (and additional molecules appear or disappear) when you alter the xmin...zmax boundaries, or it automatically adds [or destroys] polyhedra when you [de]activate the "Create polyhedra" checkbox and/or changes the elements to become centers of coordination polyhedra. The Auto Picture Creator has three categories: "Picture building" (where you can choose a building scheme or Diamond's proposed building), "Picture design" (where you can choose a design scheme, see below), and "Picture viewing" (where you choose projection and viewing direction). Note: If you prefer manual building up of structure pictures - The Auto Picture Creator is optional and can be switched off - you have full access to the (manual) building functions you know from Diamond 3 and earlier as well. A common need is the usage of different designs for structure pictures for different purposes, e.g. a screen presentation with dark background, a color printout with white background, or a black-on-white sketch for a publication. For these purposes, you can choose from a set of pre-defined design schemes or define a new scheme from current settings for later application. (You may compare this with a "style sheet" in a word processor.) So you need not change atom and bond colors etc. in your structure pictures again and again. By default, Diamond automatically creates a structure picture for a new (imported) structure. This automatic creation has been enhanced relative to the one already available in Diamond 3 and considers the chemistry of the structure and the individual atomic environments in a better way (molecular vs. typical inorganic structure). You can switch this automatic picture creation off or use individually tailored building schemes instead (see below) - or use the "Auto Picture Creator" (see above). 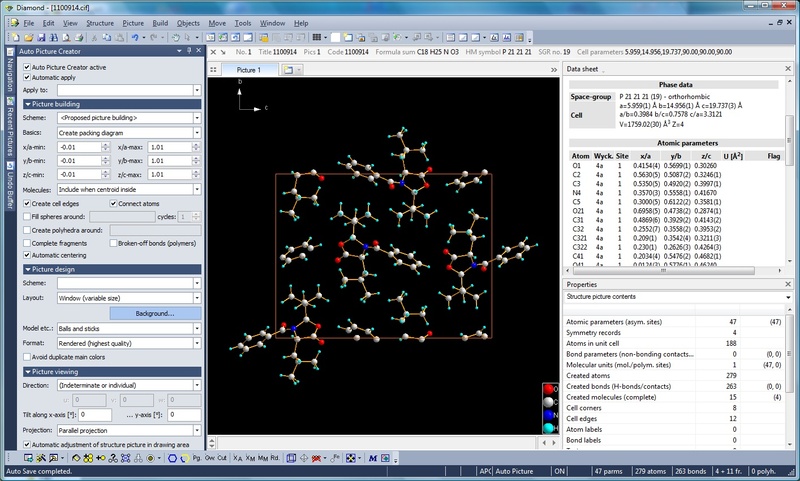 The building schemes (in Diamond 3 called "Auto-Build") have been enhanced to reflect the new functions supporting non-bonding contact and H-bond definitions as well as the new packing and molecular cluster creation functions. (The corresponding first pages of the "Picture Creation Assistant" reflect these extensions as well.) A building scheme can now also be run in an "Apply now" manner (make slight change and re-create picture from scratch), so you can better experience your structure.